What Facebook Permissions Will I Need To Connect With Shoelace? We're excited for you to get started 😃 but first you need to make sure that you have all the right permissions in order to connect with us successfully. Before checking that you have the right permissions you should make sure that you have a Facebook Business Manager account setup. 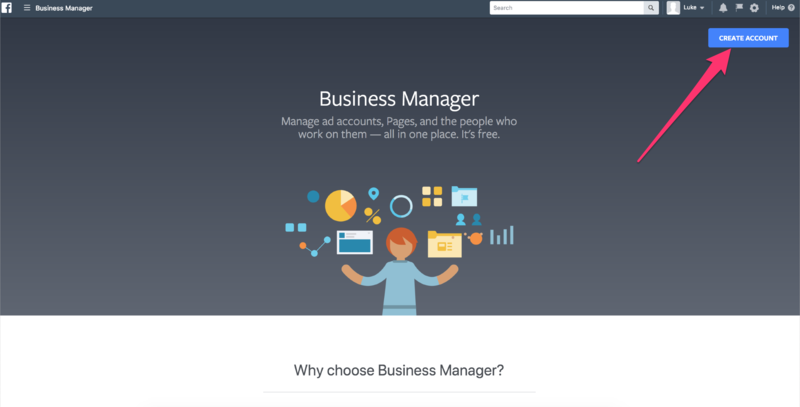 If you have never setup a Facebook Business Manager account before then you will have to go ahead and create your Business Manager account here. Now that you have all of the accounts that you will need, let's take a look at the permissions that you will need to have in place on each account in order to connect with Shoelace successfully. The first thing that you need to do in order to get started with us is check whether or not you are an admin of the Facebook Page that you want to connect Shoelace to. You can do this from your Facebook Page by navigating to Business Manager. You can now see who has permissions on your page and what level of permissions that they have. You should confirm here that you have the correct admin permissions. If you don't have the correct permissions you should ask the person in your business that owns or setup your page to make you an admin. 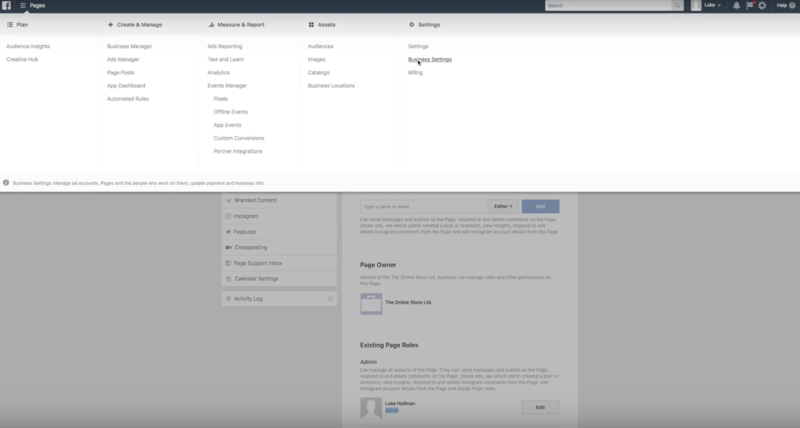 Next you need to check whether you are an admin on the Facebook Business Manager that owns the Ad Account that you want to connect Shoelace to. 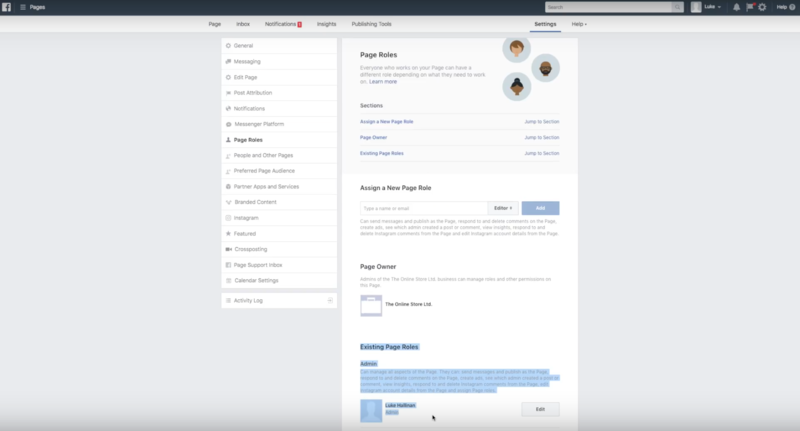 You can check the permissions that you have on your Facebook Business Manager by navigating to your Facebook Business Manager Business Settings. Finally you need to check whether you an admin for the Facebook Ad Account that you want to connect to. You can do this by clicking Ad Accounts in the left hand column of your Facebook Business Manager. From here click the Ad Account you wish to connect to Shoelace and then hover over your name in the People section to check your permissions. Once it says admin you're all set! If you don't have admin permissions you should ask for them from the owner of your Business Manager account. You should also make sure that your the payment details that you have connected to your Ad Account are up to date otherwise Facebook will not allow us to create retargeting ads on your behalf. Note: We are unable to use Ad Accounts that have been created by alternative services such as Retarget App due to the fact that any ads created on these accounts will automatically be deleted by Retarget App, preventing us from creating and running retargeting ads on your behalf. 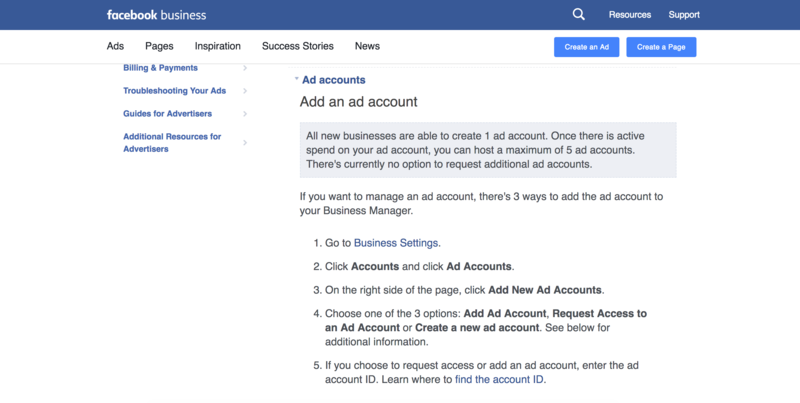 While you're here you should double check that your business manager account owns the Ad Account and Facebook Page that you want to connect Shoelace to. You can do this by checking whether the Business Manager Account referenced in the "Owned by" section matches the Business Manager that you are logged into. You should do this for both your Ad Account and Facebook Page by checking the "Owned By" section in the Ad Account and Pages tab respectively. If your Business Manager does not have ownership of your Ad Account then you will need to request access. You can request access to an Ad Account by navigating to the Ad Accounts tab on the left hand side of the screen, clicking the "+ Add" button and then clicking "Add an Ad Account". If your Business Manager does not have ownership of your Facebook Page then you will need to request access. You can request access to a Facebook Page by navigating to the Pages tab on the left hand side of the screen, clicking the "+ Add" button and then clicking "Add a Page". Each Facebook Pixel is linked to an ad account. When getting started we will recommend a Pixel based on the pixel that you have connected with your Shopify store. You should ensure that you are using the correct Facebook Pixel for your Ad Account by logging into your Ad Account, clicking Ads Manager and then Pixels. From here you can see what Pixels are connected with the Ad Account that you are logged into and what their IDs are. You can then verify that the correct Pixel is connected with your Shopify store by logging into your store, clicking Online Store, Preferences and navigating to the Facebook Pixel section to confirm what Pixel is connected or to connect a Pixel for the first time.